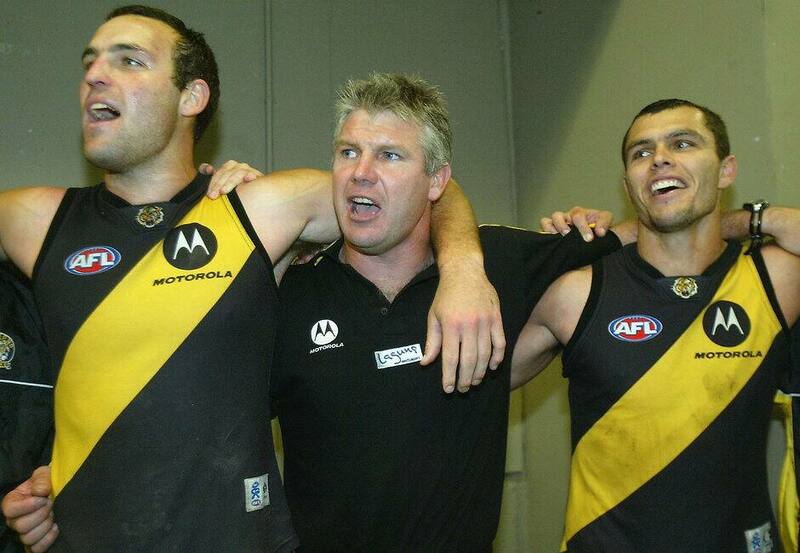 Brad Ottens, coach Danny Frawley and Andrew Kellaway celebrate a win over Sydney in 2004. In the lead-up to the 2018 AFL National Draft, which will be held later this month, Tony Greenberg has selected his best team of Richmond draftees. Firstly, let me explain the selection criteria . . .
Only those players picked up by Richmond at a National Draft since its inception in 1986 qualified. Mid-season drafts, pre-season drafts and rookie drafts were not part of the process. I also didn’t take into account the competition’s old father-son rule, thereby ruling out the (extremely talented) likes of Matthew Richardson and Joel Bowden. Back then, Richardson and Bowden were automatically eligible to join Richmond, as their respective fathers (Alan and Mike) had both played 100 games or more with the Club. Nowadays, there’s a bidding process that applies under the father-son system, which means a club has to use a draft pick on the player it wants. Notwithstanding the selection unavailability of Richardson and Bowden, this is still a formidable team of Tigers, with a healthy mix of premiership players, Brownlow Medallists, Coleman Medallists, Jack Dyer Medallists, All Australian representatives, captains, leading Club goalkickers and 200-gamers . . .